One of the original objectives of the Project was to involve local schools by offering an “Education Pack” which the schools could use as a curriculum resource. Enter Janet Roe. Janet was the tutor and conductor of the Band’s Training Band. She has a background in music education and had a good idea of the kind of thing schools might make use of. She set to designing it and when we saw the result we were all surprised at how imaginative and appealing to children she had managed to be. It was quite unlike what we had visualised, which was probably based on memories of our own school days and the kind of thing we would have encountered then. 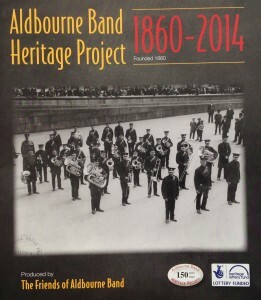 Another was a booklet distributed to all residents of Aldbourne, a PDF of this is available here. 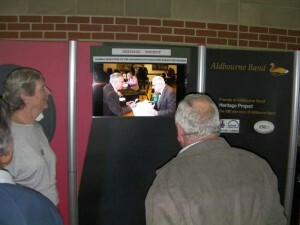 The project also created a video that was used in a video display unit. The video is available here. The storyboard used when creating the video is here, and the script for the voiceover is here. Much of the digitised material is available via historypin. JANET: Yep. When did you start playing an instrument, then?